It's been a while since I purchased a supermarket blended Scotch whisky to review. I've raided various stores over the years and you can see the list of bottles by clicking here. These have proven popular on the site as not many whisky enthusiasts will actually purchase such bargain basement offerings nor spend a bit of time reviewing and appreciating them for what they truly are. This Queen Margot blend has won several awards including most recently a gold award in 2014 from the International Spirits Challenge. So an appearance here is long overdue and I've already reviewed 2 other Lidl blends in the form of the Abrachan and the Glen Orchy 5 year old. Both I felt were decent enough examples and viable alternatives to some of the headline blends that dominate the market. These huge names have cut corners over recent years to keep profits high and their decline can be shown simply by comparing a current release against an older bottle from 10 or 20 years ago. Such established names are relying on previous heights and slick marketing nowadays to maintain their price point and retail attraction. As I explained during the Glen Orchy review the company responsible for these two blends is the Clydesdale Scotch Whisky Co. that just happens to share the same postcode as Whyte & Mackay. Look at the picture above and in particular does that caramel shadow remind you of anything? Yes, its Paterson's fake tan in a bottle! Seriously, lets see how good this blend actually is. Distillery: its a blend likely Invergordon, Fettercairn, Jura and who knows maybe a teaspoon of Dalmore? Nose: unsurprisingly grain whisky which takes me back to those banana fritters at the end of a Chinese buffet meal. Matching this sweetness is a heavy syrup sponge, then cream soda, honey and a little butter. Taste: watery at first but not unpleasant. This is a very light blend for the masses with a fresh texture. A scattering of oranges and more toffee. Ground coffee beans, sugar and more of that banana fritter once again. I paid £10.49 for this and I think that's very reasonable even with too much E150 colouring. Bells will be around £15 and Whyte & Mackay slightly more. 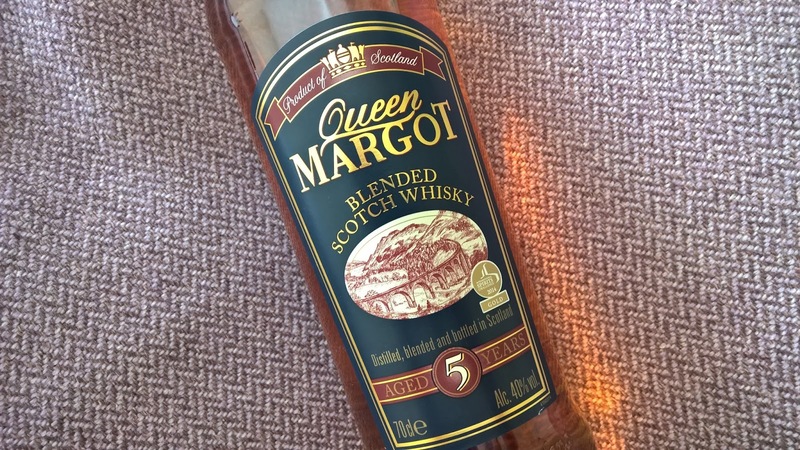 So you're saving a decent amount in comparison by purchasing this Queen Margot and I'd argue having a far more enjoyable experience.